Howard Zinn on the "discovery" of America, the treatment of the native population and how it was justified as "progress". They ... brought us parrots and balls of cotton and spears and many other things, which they exchanged for the glass beads and hawks' bells. They willingly traded everything they owned... . They were well-built, with good bodies and handsome features.... They do not bear arms, and do not know them, for I showed them a sword, they took it by the edge and cut themselves out of ignorance. They have no iron. Their spears are made of cane... . They would make fine servants.... With fifty men we could subjugate them all and make them do whatever we want. In return for bringing back gold and spices, they promised Columbus 10 percent of the profits, governorship over new-found lands, and the fame that would go with a new tide: Admiral of the Ocean Sea. He was a merchant's clerk from the Italian city of Genoa, part-time weaver (the son of a skilled weaver), and expert sailor. He set out with three sailing ships, the largest of which was the Santa Maria, perhaps 100 feet long, and thirty-nine crew members. The Indians, Columbus reported, "are so naive and so free with their possessions that no one who has not witnessed them would believe it. When you ask for something they have, they never say no. To the contrary, they offer to share with anyone...." He concluded his report by asking for a little help from their Majesties, and in return he would bring them from his next voyage "as much gold as they need ... and as many slaves as they ask." He was full of religious talk: "Thus the eternal God, our Lord, gives victory to those who follow His way over apparent impossibilities." The chief source-and, on many matters the only source-of information about what happened on the islands after Columbus came is Bartolome de las Casas, who, as a young priest, participated in the conquest of Cuba. For a time he owned a plantation on which Indian slaves worked, but he gave that up and became a vehement critic of Spanish cruelty. Las Casas transcribed Columbus's journal and, in his fifties, began a multivolume History of the Indies. In it, he describes the Indians. They are agile, he says, and can swim long distances, especially the women. They are not completely peaceful, because they do battle from time to time with other tribes, but their casualties seem small, and they fight when they are individually moved to do so because of some grievance, not on the orders of captains or kings. Marriage laws are non-existent men and women alike choose their mates and leave them as they please, without offense, jealousy or anger. They multiply in great abundance; pregnant women work to the last minute and give birth almost painlessly; up the next day, they bathe in the river and are as clean and healthy as before giving birth. If they tire of their men, they give themselves abortions with herbs that force stillbirths, covering their shameful parts with leaves or cotton cloth; although on the whole, Indian men and women look upon total nakedness with as much casualness as we look upon a man's head or at his hands. Las Casas tells how the Spaniards "grew more conceited every day" and after a while refused to walk any distance. They "rode the backs of Indians if they were in a hurry" or were carried on hammocks by Indians running in relays. "In this case they also had Indians carry large leaves to shade them from the sun and others to fan them with goose wings." After each six or eight months' work in the mines, which was the time required of each crew to dig enough gold for melting, up to a third of the men died. Past the elementary and high schools, there are only occasional hints of something else. Samuel Eliot Morison, the Harvard historian, was the most distinguished writer on Columbus, the author of a multivolume biography, and was himself a sailor who retraced Columbus's route across the Atlantic. In his popular book Christopher Columbus, Mariner, written in 1954, he tells about the enslavement and the killing: "The cruel policy initiated by Columbus and pursued by his successors resulted in complete genocide." But he does something else-he mentions the truth quickly and goes on to other things more important to him. Outright lying or quiet omission takes the risk of discovery which, when made, might arouse the reader to rebel against the writer. To state the facts, however, and then to bury them in a mass of other information is to say to the reader with a certain infectious calm: yes, mass murder took place, but it's not that important-it should weigh very little in our final judgments; it should affect very little what we do in the world. My argument cannot be against selection, simplification, emphasis, which are inevitable for both cartographers and historians. But the map-maker's distortion is a technical necessity for a common purpose shared by all people who need maps. The historian's distortion is more than technical, it is ideological; it is released into a world of contending interests, where any chosen emphasis supports (whether the historian means to or not) some kind of interest, whether economic or political or racial or national or sexual. Furthermore, this ideological interest is not openly expressed in the way a mapmaker's technical interest is obvious ("This is a Mercator projection for long-range navigation-for short-range, you'd better use a different projection"). No, it is presented as if all readers of history had a common interest which historians serve to the best of their ability. This is not intentional deception; the historian has been trained in a society in which education and knowledge are put forward as technical problems of excellence and not as tools for contending social classes, races, nations. The treatment of heroes (Columbus) and their victims (the Arawaks)-the quiet acceptance of conquest and murder in the name of progress-is only one aspect of a certain approach to history, in which the past is told from the point of view of governments, conquerors, diplomats, leaders. It is as if they, like Columbus, deserve universal acceptance, as if they-the Founding Fathers, Jackson, Lincoln, Wilson, Roosevelt, Kennedy, the leading members of Congress, the famous Justices of the Supreme Court-represent the nation as a whole. The pretense is that there really is such a thing as "the United States," subject to occasional conflicts and quarrels, but fundamentally a community of people with common interests. It is as if there really is a "national interest" represented in the Constitution, in territorial expansion, in the laws passed by Congress, the decisions of the courts, the development of capitalism, the culture of education and the mass media. Still, understanding the complexities, this book will be skeptical of governments and their attempts, through politics and culture, to ensnare ordinary people in a giant web of nationhood pretending to a common interest. I will try not to overlook the cruelties that victims inflict on one another as they are jammed together in the boxcars of the system. I don't want to romanticize them. But I do remember (in rough paraphrase) a statement I once read: "The cry of the poor is not always just, but if you don't listen to it, you will never know what justice is." I don't want to invent victories for people's movements. But to think that history-writing must aim simply to recapitulate the failures that dominate the past is to make historians collaborators in an endless cycle of defeat. If history is to be creative, to anticipate a possible future without denying the past, it should, I believe, emphasize new possibilities by disclosing those hidden episodes of the past when, even if in brief flashes, people showed their ability to resist, to join together, occasionally to win. I am supposing, or perhaps only hoping, that our future may be found in the past's fugitive moments of compassion rather than in its solid centuries of warfare. Cortes then began his march of death from town to town, using deception, turning Aztec against Aztec, killing with the kind of deliberateness that accompanies a strategy-to paralyze the will of the population by a sudden frightful deed. And so, in Cholulu, he invited the headmen of the Cholula nation to the square. And when they came, with thousands of unarmed retainers, Cortes's small army of Spaniards, posted around the square with cannon, armed with crossbows, mounted on horses, massacred them, down to the last man. Then they looted the city and moved on. When their cavalcade of murder was over they were in Mexico City, Montezuma was dead, and the Aztec civilization, shattered, was in the hands of the Spaniards. All this is told in the Spaniards' own accounts. In Peru, that other Spanish conquistador Pizarro, used the same tactics, and for the same reasons- the frenzy in the early capitalist states of Europe for gold, for slaves, for products of the soil, to pay the bondholders and stockholders of the expeditions, to finance the monarchical bureaucracies rising in Western Europe, to spur the growth of the new money economy rising out of feudalism, to participate in what Karl Marx would later call "the primitive accumulation of capital." These were the violent beginnings of an intricate system of technology, business, politics, and culture that would dominate the world for the next five centuries. Jamestown itself was set up inside the territory of an Indian confederacy, led by the chief, Powhatan. Powhatan watched the English settle on his people's land, but did not attack, maintaining a posture of coolness. When the English were going through their "starving time" in the winter of 1610, some of them ran off to join the Indians, where they would at least be fed. When the summer came, the governor of the colony sent a messenger to ask Powhatan to return the runaways, whereupon Powhatan, according to the English account, replied with "noe other than prowde and disdaynefull Answers." Some soldiers were therefore sent out "to take Revenge." They fell upon an Indian settlement, killed fifteen or sixteen Indians, burned the houses, cut down the corn growing around the village, took the queen of the tribe and her children into boats, then ended up throwing the children overboard "and shoteinge owit their Braynes in the water." The queen was later taken off and stabbed to death. Since the Indians were better woodsmen than the English and virtually impossible to track down, the method was to feign peaceful intentions, let them settle down and plant their com wherever they chose, and then, just before harvest, fall upon them, killing as many as possible and burning the corn... . Within two or three years of the massacre the English had avenged the deaths of that day many times over. I have seen two generations of my people the.... I know the difference between peace and war better than any man in my country. I am now grown old, and must the soon; my authority must descend to my brothers, Opitehapan, Opechancanough and Catatough-then to my two sisters, and then to my two daughters-I wish them to know as much as I do, and that your love to them may be like mine to you. Why will you take by force what you may have quietly by love? Why will you destroy us who supply you with food? What can you get by war? We can hide our provisions and run into the woods; then you will starve for wronging your friends. Why are you jealous of us? We are unarmed, and willing to give you what you ask, if you come in a friendly manner, and not so simple as not to know that it is much better to eat good meat, sleep comfortably, live quietly with my wives and children, laugh and be merry with the English, and trade for their copper and hatchets, than to run away from them, and to lie cold in the woods, feed on acorns, roots and such trash, and be so hunted that I can neither eat nor sleep. In these wars, my men must sit up watching, and if a twig break, they all cry out "Here comes Captain Smith!" So I must end my miserable life. Take away your guns and swords, the cause of all our jealousy, or you may all die in the same manner. When the Pilgrims came to New England they too were coming not to vacant land but to territory inhabited by tribes of Indians. The governor of the Massachusetts Bay Colony, John Winthrop, created the excuse to take Indian land by declaring the area legally a "vacuum." The Indians, he said, had not "subdued" the land, and therefore had only a "natural" right to it, but not a "civil right." A "natural right" did not have legal standing. The Puritans also appealed to the Bible, Psalms 2:8: "Ask of me, and I shall give thee, the heathen for thine inheritance, and the uttermost parts of the earth for thy possession." And to justify their use of force to take the land, they cited Romans 13:2: "Whosoever therefore resisteth the power, resisteth the ordinance of God: and they that resist shall receive to themselves damnation." They had commission to pat to death the men of Block Island, but to spare the women and children, and to bring them away, and to take possession of the island; and from thence to go to the Pequods to demand the murderers of Captain Stone and other English, and one thousand fathom of wampum for damages, etc. and some of their children as hostages, which if they should refuse, they were to obtain it by force. 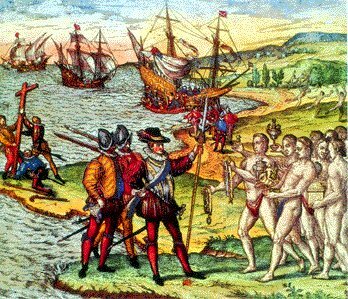 The English landed and killed some Indians, but the rest hid in the thick forests of the island and the English went from one deserted village to the next, destroying crops. Then they sailed back to the mainland and raided Pequot villages along the coast, destroying crops again. One of the officers of that expedition, in his account, gives some insight into the Pequots they encountered: "The Indians spying of us came running in multitudes along the water side, crying, What cheer, Englishmen, what cheer, what do you come for? They not thinking we intended war, went on cheerfully... -"
So, the war with the Pequots began. Massacres took place on both sides. The English developed a tactic of warfare used earlier by Cortes and later, in the twentieth century, even more systematically: deliberate attacks on noncombatants for the purpose of terrorizing the enemy. This is ethno historian Francis Jennings's interpretation of Captain John Mason's attack on a Pequot village on the Mystic River near Long Island Sound: "Mason proposed to avoid attacking Pequot warriors, which would have overtaxed his unseasoned, unreliable troops. Battle, as such, was not his purpose. Battle is only one of the ways to destroy an enemy's will to fight. Massacre can accomplish the same end with less risk, and Mason had determined that massacre would be his objective." As Dr. Cotton Mather, Puritan theologian, put it: "It was supposed that no less than 600 Pequot souls were brought down to hell that day." The terror was very real among the Indians, but in rime they came to meditate upon its foundations. They drew three lessons from the Pequot War: (1) that the Englishmen's most solemn pledge would be broken whenever obligation conflicted with advantage; (2) that the English way of war had no limit of scruple or mercy; and (3) that weapons of Indian making were almost useless against weapons of European manufacture. These lessons the Indians took to heart. A footnote in Virgil Vogel's book This Land Was Ours (1972) says: "The official figure on the number of Pequots now in Connecticut is twenty-one persons." Forty years after the Pequot War, Puritans and Indians fought again. This time it was the Wampanoags, occupying the south shore of Massachusetts Bay, who were in the way and also beginning to trade some of their land to people outside the Massachusetts Bay Colony. Their chief, Massasoit, was dead. His son Wamsutta had been killed by Englishmen, and Wamsuttas brother Metacom (later to be called King Philip by the English) became chief. The English found their excuse, a murder which they attributed to Metacom, and they began a war of conquest against the Wampanoags, a war to take their land. They were clearly the aggressors, but claimed they attacked for preventive purposes. As Roger Williams, more friendly to the Indians than most, put it: "All men of conscience or prudence ply to windward, to maintain their wars to be defensive." For a while, the English tried softer tactics. But ultimately, it was back to annihilation. The Indian population of 10 million that lived north of Mexico when Columbus came would ultimately be reduced to less than a million. Huge numbers of Indians would the from diseases introduced by the whites. A Dutch traveler in New Netherland wrote in 1656 that "the Indians ... affirm, that before the arrival of the Christians, and before the smallpox broke out amongst them, they were ten times as numerous as they now are, and that their population had been melted down by this disease, whereof nine-tenths of them have died." When the English first settled Martha's Vineyard in 1642, the Wampanoags there numbered perhaps three thousand. There were no wars on that island, but by 1764, only 313 Indians were left there. Similarly, Block Island Indians numbered perhaps 1,200 to 1,500 in 1662, and by 1774 were reduced to fifty-one. That quick disposal might be acceptable ("Unfortunate, yes, but it had to be done") to the middle and upper classes of the conquering and "advanced" countries. But is it acceptable to the poor of Asia, Africa, Latin America, or to the prisoners in Soviet labor camps, or the blacks in urban ghettos, or the Indians on reservations-to the victims of that progress which benefits a privileged minority in the world? Was it acceptable (or just inescapable?) to the miners and railroaders of America, the factory hands, the men and women who died by the hundreds of thousands from accidents or sickness, where they worked or where they lived-casualties of progress? And even the privileged minority-must it not reconsider, with that practicality which even privilege cannot abolish, the value of its privileges, when they become threatened by the anger of the sacrificed, whether in organized rebellion, unorganized riot, or simply those brutal individual acts of desperation labeled crimes by law and the state? Widely dispersed over the great land mass of the Americas, they numbered approximately 75 million people by the rime Columbus came, perhaps 25 million in North America. Responding to the different environments of soil and climate, they developed hundreds of different tribal cultures, perhaps two thousand different languages. They perfected the art of agriculture, and figured out how to grow maize (corn), which cannot grow by itself and must be planted, cultivated, fertilized, harvested, husked, shelled. They ingeniously developed a variety of other vegetables and fruits, as well as peanuts and chocolate and tobacco and rubber. In the vision of the Mohawk chief Iliawatha, the legendary Dekaniwidah spoke to the Iroquois: "We bind ourselves together by taking hold of each other's hands so firmly and forming a circle so strong that if a tree should fall upon it, it could not shake nor break it, so that our people and grandchildren shall remain in the circle in security, peace and happiness." In the villages of the Iroquois, land was owned in common and worked in common. Hunting was done together, and the catch was divided among the members of the village. Houses were considered common property and were shared by several families. The concept of private ownership of land and homes was foreign to the Iroquois. A French Jesuit priest who encountered them in the 1650s wrote: "No poorhouses are needed among them, because they are neither mendicants nor paupers.. . . Their kindness, humanity and courtesy not only makes them liberal with what they have, but causes them to possess hardly anything except in common." Women were important and respected in Iroquois society. Families were matrilineal. That is, the family line went down through the female members, whose husbands joined the family, while sons who married then joined their wives' families. Each extended family lived in a "long house." When a woman wanted a divorce, she set her husband's things outside the door. The women tended the crops and took general charge of village affairs while the men were always hunting or fishing. And since they supplied the moccasins and food for warring expeditions, they had some control over military matters. As Gary B. Nash notes in his fascinating study of early America, Red, White, and Black: "Thus power was shared between the sexes and the European idea of male dominancy and female subordination in all things was conspicuously absent in Iroquois society." Children in Iroquois society, while taught the cultural heritage of their people and solidarity with the tribe, were also taught to be independent, not to submit to overbearing authority. They were taught equality in status and the sharing of possessions. The Iroquois did not use harsh punishment on children; they did not insist on early weaning or early toilet training, hut gradually allowed the child to learn self-care. All of this was in sharp contrast to European values as brought over by the first colonists, a society of rich and poor, controlled by priests, by governors, by male heads of families. For example, the pastor of the Pilgrim colony, John Robinson, thus advised his parishioners how to deal with their children: "And surely there is in all children ... a stubbornness, and stoutness of mind arising from natural pride, which must, in the first place, be broken and beaten down; that so the foundation of their education being laid in humility and tractableness, other virtues may, in their time, be built thereon." No laws and ordinances, sheriffs and constables, judges and juries, or courts or jails-the apparatus of authority in European societies-were to be found in the northeast woodlands prior to European arrival. Yet boundaries of acceptable behavior were firmly set. Though priding themselves on the autonomous individual, the Iroquois maintained a strict sense of right and wrong.... He who stole another's food or acted invalourously in war was "shamed" by his people and ostracized from their company until he had atoned for his actions and demonstrated to their satisfaction that he had morally purified himself. They were people without a written language, but with their own laws, their poetry, their history kept in memory and passed on, in an oral vocabulary more complex than Europe's, accompanied by song, dance, and ceremonial drama. They paid careful attention to the development of personality, intensity of will, independence and flexibility, passion and potency, to their partnership with one another and with nature. John Collier, an American scholar who lived among Indians in the 1920s and 1930s in the American Southwest, said of their spirit: "Could we make it our own, there would be an eternally inexhaustible earth and a forever lasting peace." Perhaps there is some romantic mythology in that. But the evidence from European travelers in the sixteenth, seventeenth, and eighteenth centuries, put together recently by an American specialist on Indian life, William Brandon, is overwhelmingly supportive of much of that "myth." Even allowing for the imperfection of myths, it is enough to make us question, for that time and ours, the excuse of progress in the annihilation of races, and the telling of history from the standpoint of the conquerors and leaders of Western civilization. This IS disturbing, but beneath the outward blissful appearance (the mythical ideal) there lurked an hierarchical monster. This is from the opening chapters of Zinn's comprehensive revisionist history of the United States. The following chapters on the American War of Independence are very eye-opening for anyone who got a standard US elementary school education on the subject, exploring how acts of rebellion by the nation's poor and enslaved people were hijacked by the emerging American merchant class to replace the old Loyalist aristocracy with a new one that had no responsibilities to the British Empire. It sounds like batswill is suggesting that the pre-Colombian societies of North America must have had their own violent hierarchies, but I have trouble imagining how it could have been nearly as bad as the hell imposed on them by the colonizers.